Could Saudi Arabia be Bath Iron Works’ next big customer? 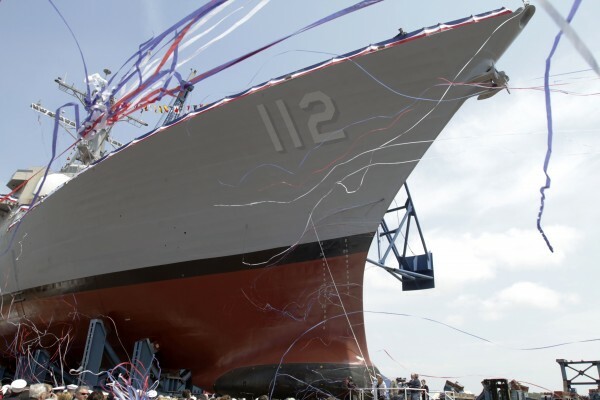 The christening of the Murphy, the last in a series of Arleigh Burke class destroyers, takes place in May at Bath Iron Works' shipyard in Bath, Maine. The Arleight Burke class of destroyer is among those being considered by the Kingdom of Saudi Arabia as the country seeks to overhaul its seaborne military. BATH, Maine — Historically a dealer of warships exclusively to the U.S. Navy, Bath Iron Works may find itself a new big-spending customer in the coming years: the Kingdom of Saudi Arabia. The Saudi government is eyeing a major overhaul of its seaborne military, and multiple reports suggest the deep-pocketed Arabian monarchy is willing to spend between $20 billion and $23 billion to accomplish the job. Among the vessels potentially on the Saudis’ shopping list are DDG-51 Arleigh Burke class destroyers, a U.S. program for which BIW is the lead shipyard. While BIW, the state’s largest single-site employer with 5,700 workers, hasn’t built for a foreign military since constructing a destroyer for West Germany in 1970, a company spokesman said the yard would be open to the idea of working with the Saudis. A new buyer for BIW products would be welcome as the shipyard deals with uncertain shipbuilding plans domestically, said the president of the largest labor union at the yard. The Navy’s procurement plans for surface combatants, such as the DDG-51s, have been shifting and unpredictable. It took nearly 18 months longer than expected for BIW and the Navy to reach an agreement on contract terms for the second and third ships in the truncated, three-ship DDG-1000 program, and shipyard workers are waiting to learn what share of the workload Bath will take in restarting the now 25-year-old Arleigh Burke program once they’re done with the final DDG-1000. In late 2009, the Navy announced it would abandon the prospective CG(X) cruiser program, which was slated to be launched in 2017 and long was viewed as the next major source of work for surface combatant builders. But Dan Dowling, president of the 3,400-member Local S6 of the Machinists union, said he’s wary of rumors that the Saudi government will step in to become a more reliable customer for BIW. “I’d pretty much look at it with a little protective skepticism,” said Dowling, noting the shipyard’s failed bids in recent years on new Coast Guard cutters and Army-Navy joint high-speed vessels, contracts that would have opened the door for BIW to different markets. U.S. Navy spokeswoman Capt. Cate Mueller confirmed to the Bangor Daily News this week that the service has prepared pricing and availability estimates for the Royal Saudi Naval Forces, which last year contacted the Navy about acquiring “medium surface combat ships with integrated air and missile defense capability,” among other equipment and infrastructure. “No decision on specific platforms or systems has been made at this stage, and we expect to continue further requirements discussions with the RSNF,” Mueller said in a statement. The stability of the kingdom — which sits in a region where anti-government uprisings have ignited in recent months — is not a concern, said Loren Thompson, defense expert with the Virginia-based think tank the Lexington Institute. Thompson said that the biggest threat to BIW eventually being able to sell Arleigh Burkes to Saudi Arabia may be simply that the Saudi government opts to go with a different ship platform, such as their oft-cited favorite, the shallow-water Littoral Combat Ships, which are not built in Bath. The kingdom could purchase a number of each type of ship, as well. Arleigh Burke class destroyers, at about 510 feet in length each, cost about $1 billion apiece. The much smaller Littoral Combat Ships carry price tags of less than $500 million each. Also vying for work building Arleigh Burkes is BIW’s longtime competitor, Ingalls Shipyard in Pascagoula, Miss., but Thompson said Bath Iron Works would be the logical front-runner for Saudi work because of its superior track record for quality and efficiency. International competitors seeking to do shipbuilding business with the Saudis are Spain, the United Kingdom, Germany and France, added Korman.